All of these are unsolicited E-mail from customers this and past years. Hi Ed. Wanted to let you know we received the arrows. than anything I would have been able to craft, so thank you so very much.! There’s a bunch of us that are still extremely grateful to have found you online. Ed: The arrows arrived extremely safe (nice packaging) and look absolutely beautiful. I’ve made a lot of traditional arrows and these are TOP NOTCH. I seriously look forward to awarding these to my AOLs in March. Thank you so much. I may order two more if my remaining to can complete their requirements. We’ll have to wait and see. I will absolutely be recommending these and your work to anyone I talk to about AOL awards. I can’t say enough about the quality of the arrow and the superior service that I received from Arrow of Light Awards. There was a mix up and my son’s arrow for his Arrow of Light award was not ordered in a timely manner. I contacted Ed at Arrow of Light Awards in a panic and he worked with me to make sure my son’s arrow arrived in time for his ceremony. I was so worried that he would be disappointed but instead we have the most beautiful handmade arrow to add to his award plaque. Thank you Ed and Arrow of Light Awards! Ten stars for the quality of your product and for your customer service! Received the order quickly and just wanted to compliment you and your artists on the arrows. They are truly beautiful. If other folks were aware of the quality of your products, I don’t believe they’d be purchasing AoL keepsakes from any other site. I’ll be sure to pass the word. Thank you again. My order just arrived and I want to say thank you for the quick shipment and beautiful arrows. The boys of Pack 1131 are going to be so happy with their arrows and these will serve to always remind them of their accomplishments with Scouts. Thank you so much for your arrows. I've passed your information on to this year's Webelos II leaders. They worked beautifully last year. I attached a picture - I wrapped the arrows with embroidery floss representing their achievements. I'm so proud of my den, and they've gone on to be great Boy Scouts! Ed, thank you so much for the immediate and quick turnaround on our recent order! Received them today via USPS, perfectly shipped, great condition. They are even more beautiful in person than the photo on the website depicts! Our graduating Scout’s receiving this special Arrow of Light award are going to be just amazed. I cannot wait to see their expressions! Will send you a photo after Blue & Gold (late February). I wanted to send a quick thank you to the Arrow-of-Light-Awards company for the speedy delivery of our arrows. The arrows themselves are amazing and the kids are going to be so excited to get them. The excellent craftsmanship is evident in the quality of the product. Kudos to your company for great customer service and producing great products. You made my day! I just wanted to thank you for the beautiful arrows that were made for our AoL ceremony. They were absolutely spectacular!!! Everyone was so impressed with the craftsmanship. I could tell that choosing these arrows made the task of making our awards a very special and sacred event. We are so proud of their accomplishments! We just can't say enough! Wanted to send a quick thank you, as I just received the arrows tonight. I was very pleased with the promptness and care placed in shipping. I was also very impressed with the quality and the craftsmanship that Laverne has put into each of these arrows, he is an amazing artist. We are a Cub Scout pack (533) out of MN, and will be using these as ceremonial arrows for our 9 boys crossing over to Boy Scouts. and will truly be cherished for years to come. I know the boys will be honored to receive them. I received my order today, and I want to let you know that the arrows look great! They were packed really well, and all eight arrived in perfect condition. One of the parents in our Cub Scout Pack recommended your business, and I will do the same in the future. Regards, John Sparreo, Cub Scout Pack 132 in Arlington Heights, IL. The arrow arrived yesterday and I couldn't be happier. What a beautiful piece of art. It is exactly what I was looking for. I searched everywhere, and while there is always a risk of "buying online", in this instance the product far exceeds the photo. Also, thank you very much for how quickly you shipped. I couldn't believe how fast it got here! I ordered the arrows by Laverne Little, and they are awesome. The arrows are well made and better then what I thought they would be. You took great pride sending these arrows. The packages were well packed and arrived very quickly. I would definitely recommend your site. Just received our order of 14 of Leo’s hand-made spotted arrows. We hand these out each year at our Blue and Gold Banquet to the Arrow of Light Recipients. I’ve been afraid to completely un-package them before the Blue and Gold as they’re packaged so nicely! But, I’ve stared long and hard at them both through the bubble wrap and the ends of the arrows and am just mesmerized. They are beautiful. Thank you for such an impressive product and pass along my compliments to Leo. Our arrow order arrived yesterday, packed to perfection. We are a new Cub Scout Pack and this will be our first Arrow of Light Ceremony and thanks to you and Mr. Holiday, it will be amazing. I can’t wait to see the looks on everyone’s face when I show them the arrows. They are truly beautiful, each one a real work of art. We will be sure to send pictures after the ceremony! Very surprised that I ordered on Monday and received it on Wednesday! Great Job in getting the materials to me. The arrows are fantastic! I'm sure the boys will enjoy receiving these in their Cross-over ceremony to Boy Scouts. I also printed out how Laverne Little made these beatiful arrows. Please express our appreciation for his craftsmanship. On February 25, 2011, we presented the Arrow of Light award to 15 WEBELOS Scouts of Cub Scout Pack 103, Williamsburg, Virginia. Among them was my son, Michael. In past years, commercial arrows had been given. Not so this year. We presented each boy with one of the Agate tip arrows made by Laverne Little. The boys were amazed and delighted with the arrows and very pleased to learn that they were Native American made. As a leader, I was impressed by the craftsmanship and care evident in each arrow. Please pass on my thanks to the builder. I hope that we have established a new tradition for our Scouts. Thank you for making this product available. I want to thank you and Mr. Holiday for your VERY fine craftsmanship of our arrows. 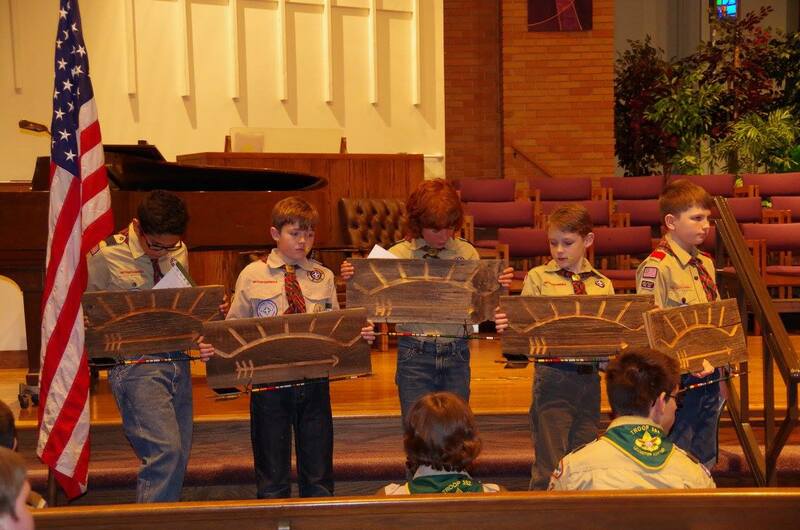 I could not be more proud to award these arrows to our scouts for their Arrow of Light. The arrows are more beautiful than I imagined. Thank you so much and your work will be forwarded to future dens to order in the future. We just completed our crossover ceremony and I wanted to let you know what a big hit the arrows were. The boys were absolutely thrilled with their arrows, and the younger scouts are eagerly awaiting the time when they can earn their own arrow of light award. Thank you so much for your assistance with my order! I've already passed your contact information on to the next Webelos leader! I just wanted to say thank you for getting our arrows shipped so promptly on such short notice. They arrived yesterday, with the holiday I didn’t expect to get them until later this week. The quality is excellent and they will make our Arrow of Light plaques something the boys will cherish for the rest of their lives. Expect our pack to be repeat customers. At every opportunity I will make sure to let people know about your service and quality. Just a quick note to let you know that the arrows arrived here just a minute ago. They are amazing and the boys will be super excited when they see them! Thank you so much for packaging them so carefully. You obviously have this down to a science. I will forward your business card on to the Cubmaster of our Pack for future reference. I received the arrows today. We got the 25” bone-tipped with the blue and gold fletching. Excellent! I’m really pleased with the product and know our Scouts will really be impressed as well. Good product, good delivery, good price, good people. What more can you ask for? I just received my order of (12) #29-16 arrows a few minutes ago, and I can't tell you how impressed I am with them. The quality and workmanship is wonderful. I know our boys, not to mention their parents, will be thrilled to when they are presented. Thank you very much and you can count on further orders from my Pack and probably others in the future. I just wanted to pass along a large thank you for your fantastic service, and wonderful quality arrows! The arrows are impeccable quality, and your packaging of them was perfect - they arrived with the fletches in perfect shape. As an E-commerce merchant myself, I can tell when someone takes their craft and business seriously, and when they have an attention to detail that merits notation. You run a class-act operation, and I want to make sure you got that feedback. 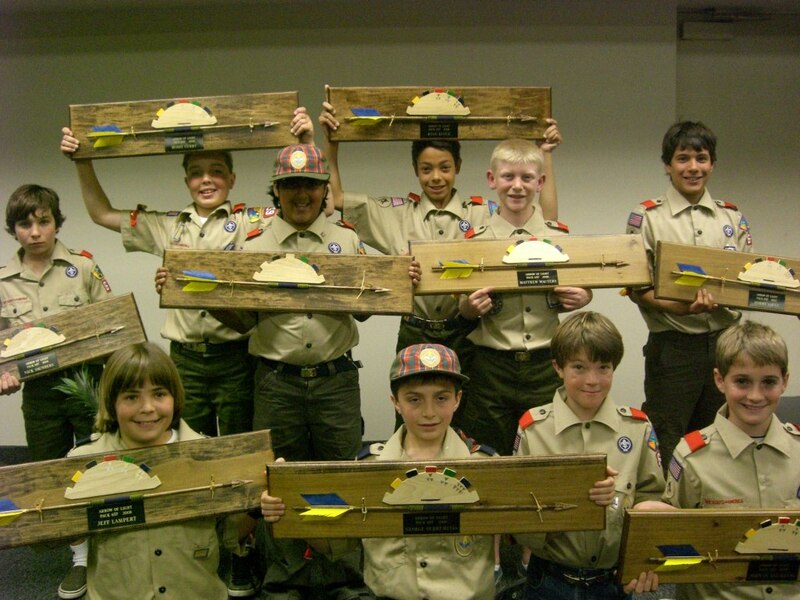 Attached is a picture of the Cubs of Pack 657. They are holding their "Arrow of Light" plaques. This would not have been possible without you. Thank you. The arrow shipment arrived Friday in perfect condition. Leo Holiday's craftsmanship will be greatly appreciated by our boys. Thank you very much for your help in getting these out to us so quickly! I spent the better part of last night painting the stripes on the arrows for the ceremony tonight. I gained an even greater appreciation for Leo Holiday's craftsmanship while working with his arrows. I have received great value in Mr. Holiday's arrows for what little I have invested. I am confident that even the least appreciative boy in our Den will treasure his arrow long after the memories of the ceremony have faded and perhaps acquire a lifelong interest in learning more about the Navajo. Thank you for making these arrows so readily available to a bunch of Yankee Cubs in Vermont, Mr. Hayden. Hi Ed, Just wanted to let you know that we received the arrows in today. They are wonderful!!! Thank you so much for filling this order for us. Appreciate all you guys do to make our Arrow of Light ceremony much more memorable. Just received the arrows! Shocked and pleased they arrived so fast! Also ... They are far more beautiful than I expected! Just GREAT! I am going to send your site URL around to other scout packs and troops! i just got my arrows!!!!!!! they are more beautiful than i expected.... and such prompt service!!!!!! Got the Arrows today and they are GREAT !!!!! The scouts will love them. Again, these arrows are beautiful. Please thank the artist. parents will want them and I will send them your way... They were shipped perfectly and came very fast. Thanks so much!!!! I would love be flattered if you could somehow put the following on your web site. Your arrows are still the topical of conversation at every scout event and it has been nearly three weeks. Our boys LOVE these arrows. I looked every where for Arrow of Light awards in my area for several months, I considered making the arrows for our graduating Arrow Of Light Scouts and then I went online and found your site. I ordered the arrows and it was an extremely easy transaction. The arrows were delivered in a matter of days and upon receiving the arrows I was so very impressed by the quality of these hand made arrows. They are just beautiful and handmade and the price is just wonderful. My Scouts and their parent's were so very impressed with these arrows, Our District Executive saw the arrows and was so impressed that he put your ordering information in our districts monthly newsletter. Thank you so very much Ed, your work is just beautiful! I wanted to personally thank you for shipping my arrows so quickly. They arrived safe and sound, and you have one satisfied customer. I have added some feathers to the arrows, and beads, and that gave them just a little more added attraction for the boys to enjoy. I'll make sure the next Arrow of Light ceremony have your arrows in it. Email for verification available on request.